Want to see the 2019 Grand Prix of the Americas in person? Tickets are available online at CircuitOfTheAmericas.com. It was back in 2015 that we, meaning I, started referring to all-world champion Marc Marquez as Captain America, since, at that time, he was undefeated on American soil. Here in early 2019 he is still undefeated in the U.S. Someone please give me a reason not to make him the odds-on favorite to keep his record immaculate, deep in the heart, on Sunday. And no astrology, please. Unbeaten in Austin, Marc Marquez is looking to make it 7-for-7 at Circuit of the Americas. Honda appears to have wound up the power and torque in the 2019 RC213V without sacrificing grip, so he’s getting out of turns even quicker and not giving away 30 meters to the Ducs in the straights. Assuming he poles on Saturday – I’m starting to hate this stuff – he may try to take the hole shot and get away at the start. I would if I were him. COTA is a point and shoot layout, ideally suited to the Honda. All of which is appalling news for those of us interested in a real championship competition, last seen in 2015, the year Valentino Rossi was to have won his 10th and final world championship and Jorge Lorenzo won his. Andrea Dovizioso got take out when Dani Pedrosa lowsided and crashed into him. 2016 was the race in which Pedrosa skittled Dovizioso. With Marquez getting away, Pedrosa arrived at a left-hander way hot, went all lowside and took Dovizioso down from behind; the Italian never knew what hit him, as it were. Besides #93, the men standing on the podium were Yamaha’s Jorge Lorenzo and a “cautious” Andrea Iannone on the Ducati GP16, paying penance for his egregious takedown of teammate and podium threat Dovizioso two weeks earlier. Maverick Viñales edged out Suzuki teammate Aleix Espargaro for 4th place that day. After winning in Qatar and Argentina, Maverick Viñales looked like he would be Marc Marquez’s top challenger. A crash on the second lap, however, put an end to his winning streak. The 2017 Red Bull Grand Prix of the Americas set the stage for another much-anticipated cage match between Yamaha phenom Viñales, undefeated at that point of the season, and triple world champion Marquez. Showing no sense of the moment, Viñales crashed out of fourth place on Lap 2, letting the air out of the balloon and ceding, at least for the moment, the lead in the world championship to teammate Valentino Rossi, with Marquez suddenly back in the game in third place. The rostrum that day featured Marquez, Rossi 2nd and Pedrosa 3rd. After winning last year’s COTA race, Marc Marquez honored the memory of Nicky Hayden with a star-spangled flag with the Kentucky Kid’s #69. Last year’s race was enthralling until the lead riders made it cleanly through Turn 1. After fooling with Iannone and his Suzuki for half a lap, #93 seized the lead and gave the grid another facial, just like he administered last week in Argentina. Iannone took the hole shot from the middle of the front row and was able to withstand the #93 onslaught for most of half a lap. Once Marquez went through cleanly, the battle for second place officially commenced. Iannone made little effort to keep Viñales out of second, and withstood a rather tepid challenge from Rossi, who took 4th. Fabio Quartararo is tied with Joan Mir at 8 points to lead this year’s class of MotoGP rookies after two rounds. 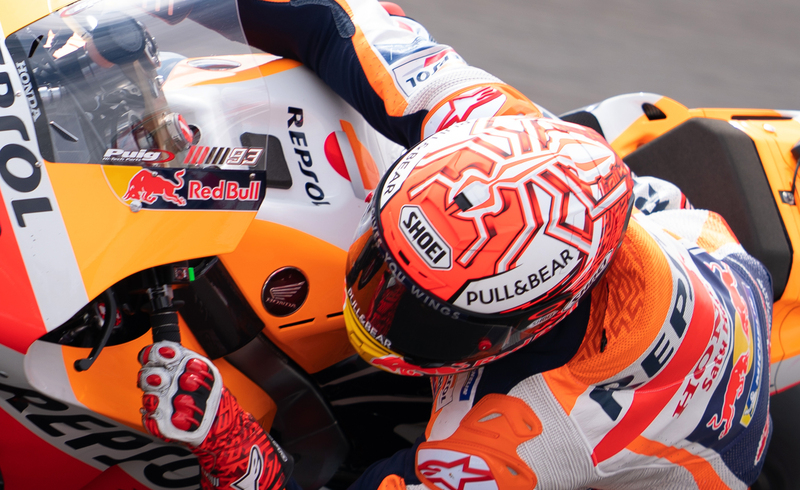 MotoGP.com is beavering away, promoting the “intense competition” amongst the fast movers up from Moto2 – Pecco Bagnaia on the Pramac Ducati, Miguel Oliveira on the KTM Warthog, Joan Mir on the Suzuki and impudent French teenager Fabio Quartararo on the Petronas Yamaha. Of the four, Quartararo has gotten off to the quickest start, qualifying 5th in Qatar before stalling the bike and starting from pit lane, qualifying 7th and finishing 8th in Argentina. MotoGP calculated that his time in Qatar would have put him in the top ten; he finished out of the points in 16th. Collectively, they trail Alex Rins by a single point. Of course, I’m being unfair here, as all four look to make some noise in the premier class in the not-too-distant future. What gets me is Dorna’s persistence in jocking every single angle of the sport in its incessant efforts to attract paid subscribers. Cal Crutchlow is calling the penalty in Argentina “ridiculous,” despite the fact that he was rolling forward at the start. True, the punishment was way out of proportion to the violation – a potential gain of .001 seconds turns into a 30 second penalty – but that requires a rule change – two categories of jumps, the lesser of the two penalties on the “long lap” instituted this year. Maverick Viñales blurted this past week about the “serious problem” he’s had with the Yamaha for the past two and a half years. Presumably Rossi has had the same problems, he’s just dealt with them better. Maverick, similar to Jorge Lorenzo, seems to need everything just perfect in order to compete. The bad news is that things are rarely, if ever, perfect in this sport, or any other. Some of us are starting to think that his start with Yamaha was a fluke and that he is, indeed, only a Tranche Two rider after all. After winning three of his first five races with the factory Yamaha team, Maverick Viñales has just one win in the next 33 rounds. Jorge Lorenzo took time out of his busy schedule to complain about everything associated with the Honda – a clutch problem in Qatar, accidentally hitting the pit lane speed limiter at the start in Argentina (refuting my theory that he was simply in third gear), brake and handlebar grips going from too hard to too soft, on and on and on. A hot track? Karel Abraham putting a sharp pass on him late in the race? Like Maverick, Jorge needs to learn to roll with things a little better. Funny how all the guys chasing Marquez have a list of complaints, while #93 doesn’t usually complain about anything at all. Jorge Lorenzo says he accidentally activated the pit lane speed limiter at the start of the Rio Hondo race. Seriously, who cares about the weather on race weekend? 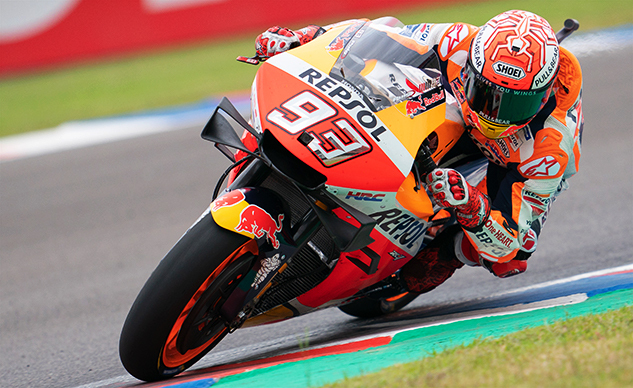 It will either be clear and warm – favoring Marquez – or it won’t, again favoring #93. Long range forecast is for clear and warm, but the long-range forecasters rarely know squat. It doesn’t matter. As my NCAA basketball brackets proved beyond question, it rarely pays to pick underdogs. Any reader wishing to predict a winner other than The Antman needs to arrive in the comments section loaded with reams of data. This Ant is ready to spoil the picnic in Austin. I’ve consulted my Magic Eight Ball again this week, looking for cosmic insights into the premier class podium on Sunday. I didn’t bother asking about Marquez, fearing a new “Are you stupid or what?” response from the cheap plastic ball. So there you have it. Marquez, Crutchlow and Miller on Sunday’s rostrum. We’ll have results right here early Sunday evening. Those of you lucky enough to be attending the race please have a great time and ride safely.